One of the most original and innovative ideas my mother had came about when she realised that I was spending far too much time watching TV and the problem required a change of policy in form of a proposal. The proposal was that I could watch 3 episodes a week on a school night as long as it the show had educational merit. So instead of watching a chat show or sitcom, I watched documentaries and current affair programs. I remember watching shows on criminology, science, politics and history – all of which would have been ignored were it not for the rule. To this day, my TV tastes have been radically altered because of that rule. If no-one’s watching it, turn the telly off! TV has an amazing effect on us. We instinctively pay attention to moving images, so when a television is on it is difficult to concentrate on other things. Remember, the “off” button is there for a reason. Buy a TV guide, and agree in advance which programmes your children will watch. This won’t take long, and will save your children from hours of zombie-like channel surfing. Most Sunday newspapers have a weekly TV guide included. Set rules for acceptable programmes together, and develop a list of programmes to be watched. Agree with your children how much time the family will spend watching TV during the week. Remember to be firm during the negotiations. Your kids need to know that you are the boss – much easier with younger children. Record movies and programmes that you like, and watch them at convenient times. This can help to minimise the effect that TV has on your family’s sleeping and eating patterns. 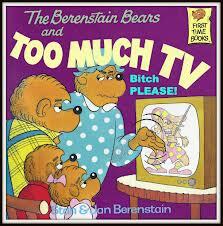 Explain to your children the reason why too much TV is a bad idea, and get their opinions. This is crucial, since you want your children to develop good TV habits that they will take with them into adulthood. Don’t be too dictatorial, and explain your actions. Your children will get into the habit of being discerning viewers. You’re the boss, and you need to take a lead, but you have to bring your children with you. If your children are very young, this will not be a problem – they will just accept your rules as being normal. Your kids are going to rebel against something so why not make this rebellion a positive process? Point out to your child or young adult that the TV keeps them passive and under control. Your children probably won’t like the idea of being passive zombies controlled by others. …or get rid of the dish. Why not get rid of your satellite TV and with the money you save, rent the odd movie that you’re really keen on? You’ll be able to watch your movie at a more convenient time, you won’t be bombarded with adverts, and you will probably save money. Don’t eat in front of the telly! When you are looking at the box, you find it harder to keep track of how full you are. For this reason people tend to overeat when they are watching television. When children routinely eat meals in front of the TV they are more likely to become overweight. The odd bit of popcorn during a movie is OK, but in general don’t let your family eat meals in front of the TV. You don’t have to ditch the TV completely, although believe it or not some people take this option and live perfectly normal lives. TV isn’t all bad…you can see great movies, there are fantastic educational documentaries, and there are great comedy and entertainment shows. Just make sure that you control the TV, and the TV doesn’t control you! This entry was posted on September 17, 2013 at 10:54 pm and is filed under Parenting. You can follow any responses to this entry through the RSS 2.0 feed. You can leave a response, or trackback from your own site.